As part of the PUSH festival at HOME theatre in Manchester, Mothers Who Make held a day celebrating the creativity in the group. The morning was a skill share where I took part in playful games, creative writing, ceilidh dancing and led the group in making fabric apples that gave them a new skill while considering their on skills & gifts. The afternoon was entitled Over The Kitchen Table, a reference to where creative mothers often end up working to maintain their creative lives. 10 of us each had a table to present ourselves. It was a fabulous, inspiring afternoon of art, music and writing/theatre. I discovered new artists, particularly connecting with Sarah Greaves embroidery work into objects – her fabulous door (see photo) and her collection of stitched actual pomegranates made with the Armenian community in Manchester exploring her own heritage. Clare Cameron’s emotional performance brought tears and really connected with the writings of Felicity Goodman. Susan Swanton’s growing series of portraits “Invisible Woman” featured several members of the group. It was good to hear the accompanying interviews having seen the photos on Instagram. I shared my textile work. I was originally due to be doing a live freehand embroidery demonstration but found out last minute that they required my sewing machine to be PAT tested so just displayed and spoke about my work. I burbled about the journey from Theatre Designer to unemployed new mother to my recent growth as a textile artist and going back to college to do the Textile Practice MA at Manchester School of Art. It is probably the most I have spoken about my textile work outside of tutorials & college presentations so thank you for listening. Of course I spent the evening remembering all the things I forgot to say which will help improve my next presentation so thank you to Mothers Who Make & HOME for giving me the opportunity to share in such a supportive environment. 2. Jude Jagger – Recreation of a music rehearsal around the table by her vocal harmonies group: The Bobbysocks. 4. Susan Guest – Exhibition of ‘Invisible Women’ photos and soundscape. Check them out on Instagram. 8. 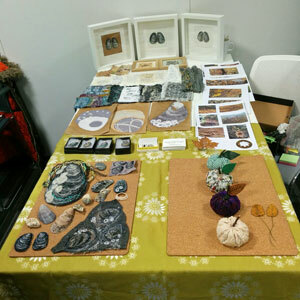 Nerissa Cargill Thompson – Textile art – She Sews Sea Shells & Art Apples on Ageing.